In the US, equipment purchased for your business before the end of the tax year can become a significant deduction when you file your taxes. Section 179 of the federal tax code allows businesses to deduct 100 percent of any qualified equipment purchases in the tax year in which it was purchased, rather than collecting a deduction for depreciation over the next five years. In other words, if you purchased a new printer for your sublimation business that costs $1,600 before the end of the year, you could deduct the entire amount on your 2017 taxes, which would reduce the amount of taxable income. Consult with a tax professional to see if this is the right idea for your business. Outside of the US, there may be similar types of situations that you can take advantage of for your business. Check with your tax and business authorities to see what options are available. Just like you, your suppliers may be offering holiday sales and end-of-the-year deals. In fact, many suppliers offer incredible Black Friday savings and packages, as well as continual sales and discounts throughout the season. For example, Sawgrass is offering a promotion to customers in US and Canada who can trade up to a new Virtuoso HD Product Decorating System and get up to four free ink cartridges until December 31 if they have a sublimation printer up to 44 inches. Buying strategically can help you start off 2018 ahead of the game. Begin your decision-making process by looking at which products sold well and at what volume in 2017. Would keeping more substrates in stock reduce shipping expenses? How much paper and ink did you need? What about packaging and shipping materials? Answering questions like these may give you quicker turnaround times and save in the long term but will require an investment in inventory. However, if the discounts are good, consider buying items you sell the most in bulk and keep them in stock. This will translate into higher margins on future sales, plus you can benefit from discounts based on quantity. In reviewing production over the past year, also consider whether a larger printer may open the doors to a wider range of services, such as large apparel prints, or help you keep up with high-volume sales. If so, consider purchasing a Virtuoso SG800, with a maximum media size of A3+ or a Sawgrass VJ 628, which prints full-bleed on 24” / 610 mm substrates. On the other hand, your current sublimation system might be ideal in terms of image size, but a bit slow in keeping up with production. Adding an additional printer to your shop might be a great solution, as it would double your printing output. Many high-volume shops manage their sublimation production needs with multiple small printers, like the SG400 and SG800 printers, rather than moving up to wide format systems. Perhaps you are ready to produce banners and signage, or want to venture into textile or photo panel production. The Virtuoso 25” / 630 mm 8-Color HD Product Decorating System featuring the Sawgrass VJ 628 printer would be the right fit for you. The industry’s first fully integrated sublimation printing solution of this size, this system offers a best-in-class print engine, sublimation ink set, software and support - all in one package. It has been designed for high-volume, high-definition printing - and is built to last, even in the most demanding production environments. SubliJet-HD Pro Photo: Created for fine art and professional photographic reproduction, this ink set offers C, M, Y, K, Lc, Lm, Lk and Llk cartridges for fine detail, enhanced skin tones and deep, rich blacks. 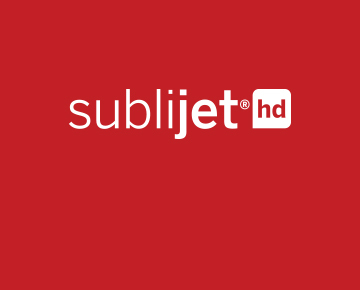 SubliJet-HD Pro Photo XF: This set builds upon the Pro Photo formula, but replaces the black cartridges with KXF, LkXF and LlkXF inks. These inks were developed in partnership with ChromaLuxe for increased UV stability, image longevity and performance on ChromaLuxe media. They have earned a print display permanence rating of 64 years from Wilhelm Imaging Research (WIR) when used to imprint ChromaLuxe high-definition photo panels, and deliver prints that last more than three times longer than those made on silver halide photo paper with other types of photographic ink. SubliJet-HD FLEX: This ink set was named 2017 Product of the Year for Digital Textile Inks by SGIA, and offers maximum versatility. You get superior coloration with CMYK catridges, plus an expanded gamut of color with additional orange and blue cartridges – PLUS fluorescent yellow and pink cartridges for true fluorescent spot colors. This set makes attaining hard-to-match colors, like reds, blues, purples and Pantones, much easier, and is the only set that offers fluorescent capabilities. November and December are great months to buy sublimation supplies and equipment. If you are considering investing in a new sublimation printer in 2018, it might make sense to purchase now and take advantage of any specials and possible tax deductions. To learn more about sublimation and transfer printing options contact a Sawgrass Dealer.